Merrell Sale is now on across all footwear! US-based Merrell is aimed for those who love the great outdoors: a company that started life as a manufacturer and seller of hiking boots, but which has grown to offer a wide variety of shoes, boots and sandals as well as jackets and coats, mid layers and fleeces, shirts, trousers and more. The Merrell team is made up of hikers, sailors, campers, runners and other outdoor enthusiasts, whose knowledge of the great outdoors helps them to provide you with a range of clothing and footwear that will not only keep you well protected during your choice of outdoor activity, but will ensure that you look great too. Add Merrell to your Favourites list and be the first to know every time they have a Sale on! 1st January 2018 - Merrell New Years Day sales for 2018. 7th May 2018 - Merrell Early May Bank Holiday sales for 2018, add to your diary now! July 2018 - Merrell Summer 2018 sales, joining us? 23rd November 2018 - Merrell Black Friday sales in 2018 start on Friday 24th November. 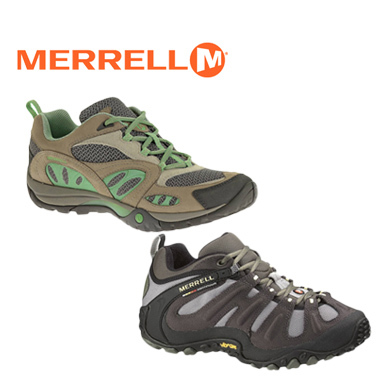 Add products from Merrell to your Love Sales list. Get the Love Sales button now! Merrell January Sale is now on across all footwear! Merrell Boxing day Sale is now on across all footwear! Merrell Christmas Sale is now on across all footwear! Merrell Cyber Monday Event is now on across all footwear! Merrell Black Friday Event is now on across all footwear!